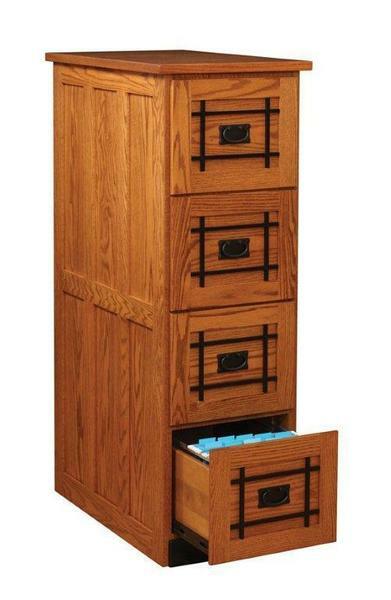 All of your file storage needs will be supplied by this Amish Mission Four-Drawer Vertical File Cabinet. It is designed to provide years of regular use along with an attractive appearance for an inviting office space. This filing cabinet is available in a variety of wood types and stain choices. This beautiful Mission filing cabinet is sure to spruce up your office space! You have plenty of filing space with the four large dovetailed drawers on full extension drawer slides with this Amish file cabinet. Drawer bottoms are solid oak plywood, the panel sides are raised and a 1" thick frame is standard on this Mission file cabinet. This File Cabinet can be purchased with upgrades like legal width size, raised panel back and locks.